The 2016 Election was always going to be tough on Senate Republicans, but Tuesday night, thing could get downright ugly. The GOP, which wrested control of the Senate away from Democrats in 2014, has known it would be facing an unfavorable map in 2016. 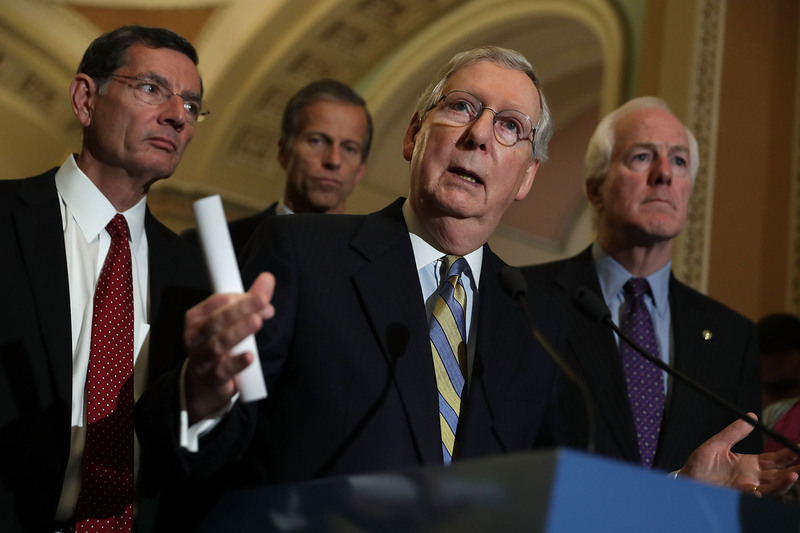 With less than 48 hours to go before Election Day, Senate Republicans may not retain control. For those of you who haven’t been eating/breathing/sleeping politics for the last 15 months (or 15 years), a quick refresher: The Senate is comprised of 100 Senators, two from each state, each of whom serve 6-year terms. Roughly a third of Senate seats are up for election every two years. When politicos talk about “bad maps” this is what they mean: this year, 34 U.S. Senate seats are up for election: 10 Democrats and 24 Republicans. According to RealClearPolitics, of those 10 Democratic seats, seven are considered “safe,” and two more lean heavily toward the Democrat in the race. The only Democrat-held seat that is vulnerable is outgoing Senate Minority leader Harry Reid’s seat in Nevada, where Republican candidate Joe Heck has a slight edge in the polls over Democrat Catherine Cortez Masto. On the other side of the aisle, only 13 of the 24 Republican seats up for election are considered “Safe,” and of the contested ones, two (Wisconsin and Illinois) are leaning heavily toward the Dems already. With the exception of Nevada, all of the tight races are for seats currently held by Republicans, meaning they’d have to win the lion’s share of competitive races to maintain their majority. Another x-factor in the battle for control of the Senate is that, when the Senate is tied 50-50, the Vice President (who also acts as the President of the Senate) provides the tie-breaking vote. Even if the GOP is able to muster 50 seats in the Senate, if Hillary Clinton wins the White House, then Tim Kaine will tip the balance towards the Dems. Nevada: As mentioned before, Reid’s seat is a true toss-up; if the Republicans lose it, they lose their best chance to flip a seat away from the Dems. Pennsylvania: Sen. Pat Toomey is defending his seat from a strong challenge by Katie McGinty. Even though the Keystone state has started polling strongly in favor of Clinton at the top of the ticket, McGinty and Toomey are running neck-and-neck for the Senate. North Carolina: Even though the state is leaning towards Clinton, things are tilting ever-so-slightly towards the Republican candidate, Richard Burr. Missouri: Conversely, the Show-Me State is expected to go for Trump, but its Senate race is in a statistical dead heat. New Hampshire: Incumbent Kelly Ayotte has struggled with how best to navigate the divisive Trump campaign, and the wear-and-tear is showing, with Democrat (and current governor) Maggie Hassan essentially tied going into Election Day. Of course, the other race to watch in the battle over the Senate is the one we can’t seem to look away from: Clinton vs. Trump. Whatever happens, Tuesday’s going to be a wild day for the Senate.